Our last guest blogger is Joyce from Friends Drift Inn. I haven't known Joyce for long, but I think everyone who knows her would agree that she's quite a spitfire and knows her way around the kitchen, both her own (in her barn!) and of chefs around the state. She hosts a regular column in the Appalachian News Express and has been published in several regional magazines. She also loves bourbon, like a true Kentucky gal! 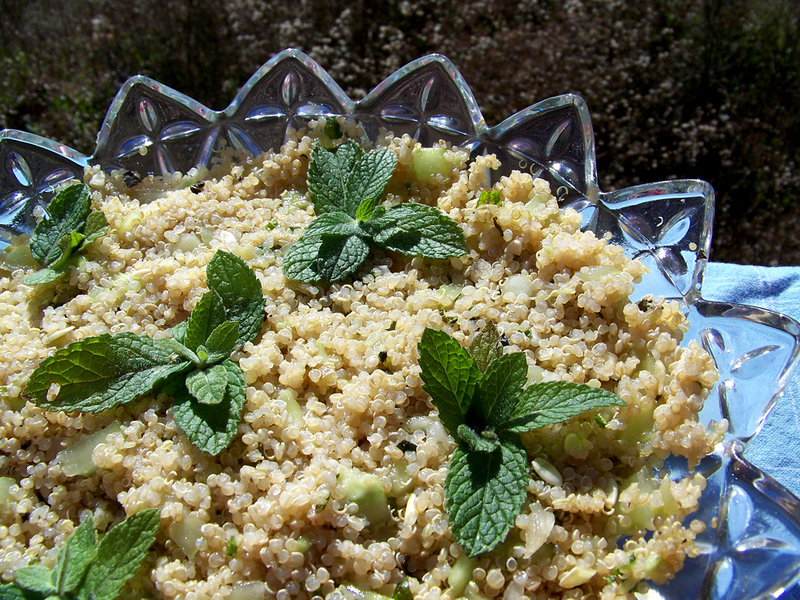 Joyce is going to share a winter quinoa salad made with Kentucky (yes, Kentucky) soy sauce. Thanks, Joyce! When Mindy sent out the S.O.S. for guest bloggers, I was quick to respond. Sometimes I bite off more than I can chew. Some exciting developments at Friends Drift Inn Farm-to-Table have had me so distracted that I almost forgot my hat! [Giggles] Mindy, hope this post is better late than never! As a farmer, I am always intrigued by heirloom vegetables and grains. Where did they come from? How did they survive into modern times? What can we do to preserve their unique genetic markers in the purest way possible? Quinoa, pronounced keen-wah, is one of the most ancient of grains. Actually, it’s not a grain at all being more closely related to beets and spinach by family ties. My cousin Jennie introduced me to the “exotic” offering last year. Because it is grown in a remote area, the genetic material is believed to be very pure. Your "vote," by purchasing quinoa, can keep this remarkable "super grain" in our contemporary lexicon and hopefully into the next generation. Quinoa was revered by the Incas as “The Mother Grain.” In modern times it is treasured by those pursuing a gluten-free lifestyle. The taste is similar to a rice or couscous. The mild flavor lends itself to palate pairings from around the globe. In the summer I favor a quinoa salad with tomatoes and a Mediterranean-style presentation. In the depths of winter when the only tomatoes available are grown in greenhouses, I change up the menu adding depth and dimension with Soy Sauce and Asian-inspired dishes. Quinoa is found on my grocery shelves here in remote Appalachia, so I assume you can find it anywhere. In our stores, it most often is found in the gluten-free section. I use a processed Quinoa which does not require a pre-soak to remove the bitter saponin seed coat. Read the cooking directions on your product to be clear on pre-soaking instructions. In a heavy saucepan, add quinoa and stock. Bring up to a rolling boil. Reduce to simmer and cover with lid. Cook about 15-20 minutes until liquid has been absorbed. The “grain” will look like little “C’s” as it expands. In a cute salad bowl combine all ingredients and toss. I generally let this stand overnight for best flavors. Garnish with mint leaves. I serve this on our appetizer table quite frequently. Vegetarians and meat-eaters alike enjoy the unique texture and taste. Photo courtesy of the guest blogger. I never thought I would see quinoa Kentucky style, Joyce! Looks delicious! I love Bourbon Barrel's soy sauce too. Now I'm going to look for quinoa in one of my favorite long island gluten free stores. Thanks for the recipe! I heard my nutritionist Long Island mention quinoa in passing. Now I'll have to ask her about it. Thanks for the recipe, I'll try it out soon.